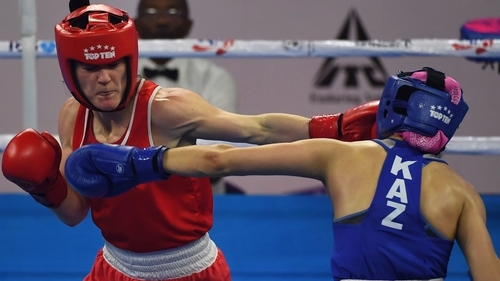 Ireland's Kellie Harrington will fight for a gold medal at the AIBA Women's World Boxing Championships in India on Saturday after claiming victory in her lightweight semi-final with Karina Ibragimova from Kazakhstan. Harrington produced a fine display of counter-punching as she sealed a unanimous points victory, which guarantees her at least a silver medal. It was close fight throughout with Ibragimova showing more aggression but Harrington made her footwork and mobility count as she picked her spots and landed with cleaner shots. The two fighters were physically evenly matched and it was a cagey opening few moments in the first round as Harrington tried to feel out her opponent. The Dublin fighter danced out of danger early on before a blistering three-punch sequence signalled her intent and gave Ibragimova some pause for thought. The Kazakh was the busier fighter throughout the first round but most of her punches were landing on Harrington's gloves while she caught Ibragimova with a couple of neat left hooks. Perhaps sensing she needed a strong finish, Harrington pushed forward for the first time and landed with a couple of decent punches up against the ropes before the bell, doing enough to take the round. Ibragimova was again the aggressor at the start of the second round throwing more punches and forcing Harrington onto the back foot. Harrington landed with a couple of nice body shots before the fight descended into a brawl for the first time, which seemed to suit the Irish fighter and she continued to work the body and connected with a neat sequence of scoring punches. The Dubliner finished with a big right hand, temporarily rocking Ibragimova and again shaded the round. Like the first, the final round started slowly and it took 30 seconds before we saw the first real exchange between the two fighters. Ibragimova, aware that she needed to do something special, again showed more aggression, coming on to Harrington who for the first time in the bout, struggled to connect with her counter-punches. Harrington was forced back when Ibragimova steamed forward throwing a flurry of jabs but with a minute to go, the Irish fighter again went to the body, landing three or four strong shots before catching the Kazakh with a powerful left hook. The final bell went with Ibragimova finishing strongly but it wasn't enough to sway the judges who all scored the fight 30-27 in favour of Harrington. She will now fight Sudaporn Seesondee for the gold medal on Saturday after the Thai fighter overcame Oh Yeonji in the other lightweight semi-final.